Nothing quite comes together in Zack Snyder’s Superman reboot, Man of Steel. All the pieces seem to be in place – first-rate special effects, supporting cast peppered with well-known names, stirring score (by Hans Zimmer), earnest unknown (relatively speaking) in the title role – but there’s no discernible heart. Now on Blu-ray, backed by an array of well-produced extras, MoS can be examined more closely. But why would anyone want to? It gets off to a promising start. Snyder and company have reimagined planet Krypton as a bronze-tinged fantasyland, teeming with flying lizards and other CG wonders. Jor-El (Russell Crowe) and Lara (Ayelet Zurer) have bucked the system by secretly having a child naturally in a world where all fetuses are harvested in underwater, artificial “wombs.” Predicting a catastrophic natural disaster, Jor-El intends to embed his son’s DNA with his race’s genetic codex and send him to an alien planet capable of sustaining a regenerated Kryptonian race. That son turns out to be Kal-El, adopted on earth by Jonathan and Martha Kent (Kevin Costner and Diane Lane), christened Clark, and later dubbed “Superman” (Henry Cavill). The Earth’s sun provides Kal-El with nearly unlimited strength and supernatural powers, which is why Jor-El assures a worried Lara that their son will be worshipped as a god. It’s all a neat set-up that announces in bold-face that this isn’t your father’s Superman. Even the handling of young Clark’s abilities (he’s understandably overwhelmed and scared by his x-ray vision and super-hearing) has a very different spin than the old 1978 Richard Donner film. But we are soon confronted by the film’s central problem: story collaborators David S. Goyer and Christopher Nolan (the former is the sole credited screenwriter) decided to make Zod the villain. Never mind the fact that we still have the awesome Zod of Superman II, expertly portrayed by Terrence Stamp. Never mind the fact that there are dozens of villains to choose from throughout the Superman comic books published over the last 75 years. In a staggeringly lazy move, the new filmmakers have decided to hedge their reboot bet by returning to something familiar. Zod (Michael Shannon) attempted a coup on Krypton before the planet exploded (as a result of over-depletion of natural resources). Not believing their planet was in such grave danger, the Krypton high council banished Zod. He was sent into orbit, encased in a suspended-animation crystal casing. But the force of the planet’s explosion jarred him free and he makes good on his promise to Jor-El and Lara that he will hunt down their son. Unlike the subtly scary, slyly funny Stamp version of Zod, Michael Shannon has one mode for his characterization: temple-popping fury. He yells, screams, and hisses his way through an over-the-top performance. Once he arrives on Earth and begins the process of terraforming the planet to create a new Krypton, MoS becomes a standard-issue “alien invasion” flick. Kal-El and Zod face off in a mano-a-mano battle that dominates the second half of the movie. Once you’ve seen one of them zoom really fast, slam into the other, and pulverize the side of a building, the effect quickly tires when repeated again and again. Amy Adams is also in the mix as an ill-defined Lois Lane. She tracks Kal-El to a Kryptonian ship currently under U.S. military investigation, quickly taking an active role in the action. Jor-El appears as an apparently fully-conscious, decision-making, intelligent hologram. Lois improbably takes things in stride as Jor-El instructs her how to fly from the now-orbiting Kryptonian ship back down to Earth in order to escape Zod’s clutches (who has apprehended her for no good reason). Regardless of what a mess of half-baked ideas MoS is, Warner Bros.’ impeccable Blu-ray presentation can’t be reasonably faulted by any stretch of the imagination. The high definition image is sterling from start to finish, offering a naturally filmic look (it was shot on 35mm). The DTS-HD Master Audio 7.1 soundtrack is basically perfect as well, with tons of surround activity and rumbling, pulsating LFE activity. While there are a handful of well-produced, conventional behind-the-scenes featurettes on disc one, the second disc is where the meat of the supplements is found. 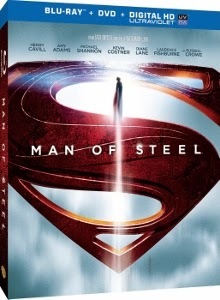 “Journey of Discovery: Creation Man of Steel” is a mash-up of picture-in-picture, audio commentary, and ‘making of’ documentary that allows for an alternate viewing experience. The film runs nearly three hours in this format, but there’s something going on during nearly every second. We hear from all the primary filmmakers and cast members, see animatics, production art, and alternate footage. It’s takes a greater commitment, time-wise, than a series of shorter featurettes, but fans of the film will find it well worth the effort.